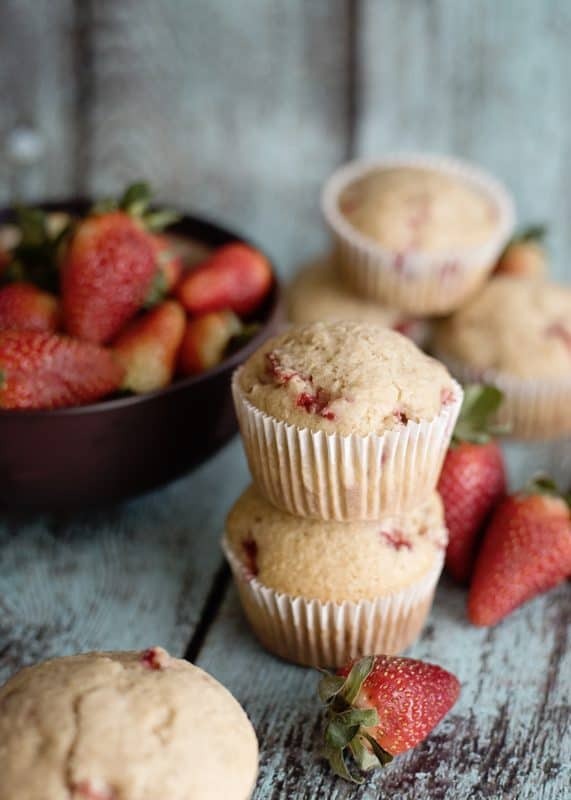 Today I’m sharing a recipe perfect for the upcoming strawberry season. One of my favorite signs of spring (apart from sunshine and flowers) are fresh strawberries. When I was a little girl, Grandmama had a strawberry patch that grew at the side of her house. It was so much fun to go sit down beside it and hunt for patches of ripe red berries amid the leaves. I don’t recall bringing too many in the house as we ate them right then and there! These days I imagine folks would want to go buy a fancy spray to clean them with, thoroughly rinse them, and gently lop the tops off before even considering such a thing but we just plopped them right into our mouths, dirt and all! Those were the good old days, when you were normal if you grew your own food, spent the majority of your day outside, and ate your share of dirt along with fresh juicy strawberries at Grandmama’s house. We have a great local farm that sets up a strawberry stand near my house as soon as the season starts. My favorite thing to do is buy two gallons: one to use in recipes and the other to simply eat. There is nothing like local grown strawberries. Make sure you save this recipe so you can make use of it as soon as they come in where you are! 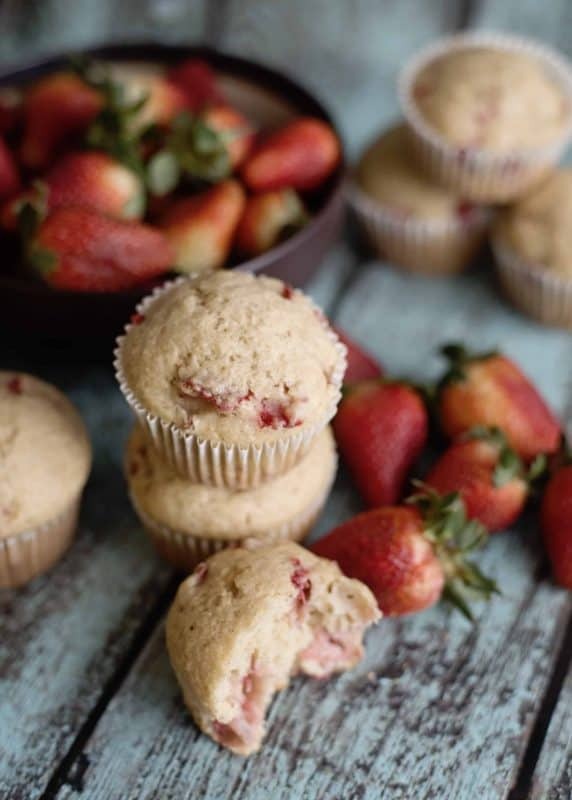 To make this recipe, you’ll need: Fresh Strawberries, All Purpose Flour, Vegetable Oil, Whole Milk, Egg, Granulated Sugar, Brown Sugar, Baking Powder, Cinnamon, Salt, and Vanilla. Preheat the oven to 375 degrees and prepare a muffin pan with either liners or non-stick spray. In a bowl, mix together the oil, vanilla, milk and egg. Set aside. In another bowl, mix together the dry ingredients – flour, salt, baking powder, cinnamon, brown sugar and granulated sugar. Toss the strawberries into the dry mixture until well coated and then add in the liquid mixture, folding lightly until well combined. Fill the liners about ¾ of the way full, should give you about 10 muffins. Bake for 25 minutes. Cool slightly and remove from the pan. These make a great breakfast, coffee snack, or afternoon pick me up. I like to have muffins for dessert after supper, too! In a bowl, mix together the oil, vanilla, milk and egg. Set aside. 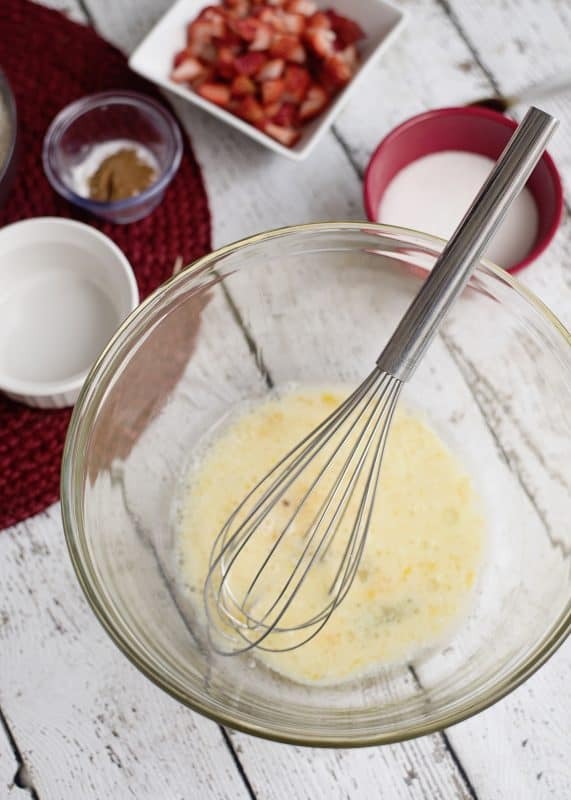 In another bowl, mix together the dry ingredients – flour, salt, baking powder, cinnamon, brown sugar and granulated sugar. Fill the liners about ¾ of the way full, should give you about 10 muffins. Baked for 25 minutes. Cool slightly and remove from the pan. Great either warm or cool! Many men can make a fortune, but few can build a family. This looks great! I need to try. Thanks for sharing. Thanks Cathy! I hope you get to try them soon. Have a great day! Yummy! I just bought a fresh bag of A.P. flour. Can’t wait to bake these. TY for sharing. Thank you so much! I hope you enjoy them. Wish I could enjoy one with you! Oh, Christy! Just thinking about these excites me! I’m so ready. I hope you find some wonderfully ripe strawberries soon Patti!! When I was a child, my Aunt Katie had a strawberry patch. We would go and pick them each year but few actually made it home. Never washed them, just stood there and ate our fill. I’ve never tasted strawberries sweeter to this day. 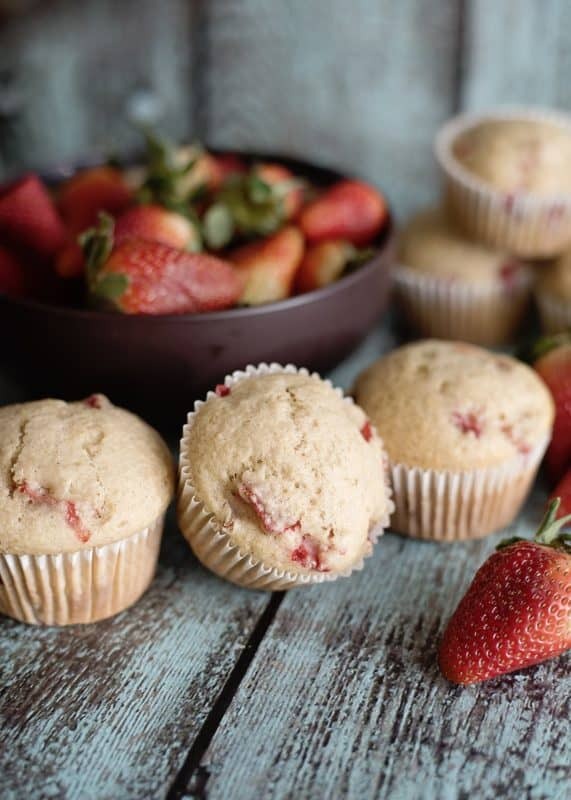 You haven’t lived until you eat strawberries this way! Amen!! Kids these days just don’t know what they are missing! Recipe is just in time to try using our FFA strawberry order that arrived yesterday. Ohhh, fresh from Florida fund-raiser strawberries! Those are always so good!! 🙂 I hope you get to enjoy some precious memories of days gone by along with some delicious muffins when you do get the chance to make them Judi! These look delicious! Is 2% milk OK to use? That’s what we always have on hand. I love everything STRAWBERRY!!! We didn’t grow up around strawberries but plenty of blackberries!!! I can’t wait to try this recipe!! My husband will really like this recipe. They look yummy . Is 1% milk ok to use? Yes, that will work fine. They are more tender with whole milk but you likely won’t be able to discern the difference if you prefer 1%. I encourage you to modify it to suit what you like best! Would you share the name of your local strawberry patch? I pass by your way at least once a month on my way to Nashville to visit my daughter and granddaughter and would love to bring some fresh strawberries when I visit. I had hopes of visiting your apple orchard/stand last fall. It didn’t work out but I have hopes of coordinating my visit with apple harvest this year. Do you have a local source for peaches too? I stopped at the farmer’s mkt in Bham last summer and bought some Chilton County peaches that were amazing. Hope they have a better harvest this year so we can grab some more. Isn’t the fresh local seasonal produce the best? Hi Barbara, I don’t mind sharing at all! I get strawberries from Dennison’s. They set up little carts all over the county selling them and I get local peaches from Isom’s in Athens. Thanks so much Christy. Looking forward to warmer weather and fresh produce from roadside stands. And making these muffins. Blessings to you and your family. Mom to isoms for peaches every year. Now live in Dallas and friends and i go to a town east of here and get peaches and veggies! Great stuff and memories! Just wondering if I can use almond milk. Hi Jan, you sure can use almond milk without any problems!! For years we have raised strawberries, raspberries and blackberries. Can I play around and substitute the different berries? I love them all – and yes – fresh from the ground! Love strawberries, can’t wait to try these. These sound delicious! My mouth is watering now, lol! Have you ever used a different berry with this recipe? I’m allergic to strawberries, so I can’t use them! Well, you always say to use what you have on hand…I have some blackberries, so I’ll try them! I have strawberries in the freezer, going to thaw them and dry off and use them. Also have some blueberries and peaches and mangoes so going to give them all of try….thank you. 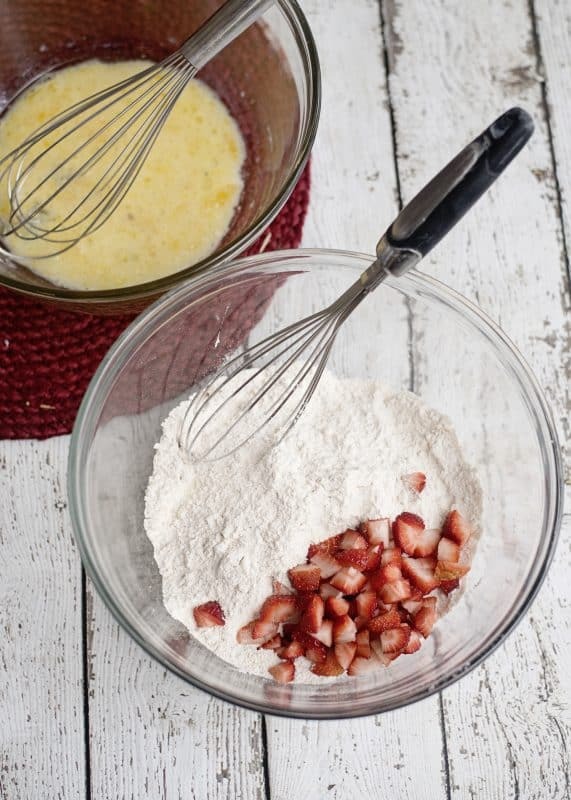 I can’t wait until fresh strawberries are in season so I can try this recipe. looks so yummy good! When will they be in season in your area Sherry? These are the best muffins I have ever made – or eaten. That is despite making them with out of season supermarket berries! They are tender, have a delicate texture, and are very moist. I used a rounded cup of berries, and ended with 11 nice plump muffins. This is my new go to muffin recipe. I plan to try it with peaches when they come in to season, and maybe diced banana, or apple. Thanks for sharing it. I am so glad you liked them!! I hope you get the chance to make them again when strawberries come into season in your area, makes a huge difference!! Just made these with fresh strawberries that were picked yesterday in South Alabama. I left out the cinnamon, used butter instead of oil. They were great. I had a little bit of homemade cream cheese cookie frosting and added some fresh strawberries! I was almost like strawberry cake! I haven’t had good luck making muffins from sliced berries but these turned out perfect! I am so glad to hear that you liked them Loretta!!! Thank you so much for giving them a try since past experience hasn’t been so good. Do you happen to know if these muffins freeze well? 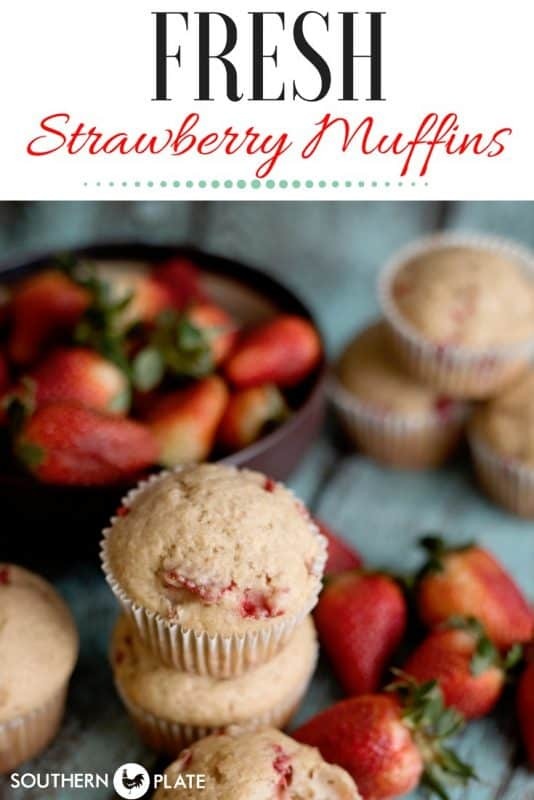 We’re taking our toddler strawberry picking this week and I definitely want to make this recipe. She is obessed with muffins right now! She asks for them everyday! So, if they freeze well, I was going to stock up. Lol! I was thinking that I’ll probably have to invest in a new freezer just for my daughter’s muffin obsession! Strawberries are arriving at the Marietta Square Farmer’s Market now. I love so many of your recipes. I make them on the weekends and have them ready to pack my husband’s lunch during the week. Thank you for sharing this recipe! I have made these muffins twice already and am baking more now. My 5 year old granddaughter said these were the BEST muffins she has ever eaten. This meemaw paid $14 yesterday at a road side stand because she and her 3 year olds sister are worth it and these muffins are delicious! The hint of cinnamon and the addition of brown sugar make these so good!!!! I am so glad to hear that y’all like them Denise!! Make sure to love on those grands a little but extra just for me! !